As said previously, I’m going all iOS this year. That means all audio, blogging, and video editing must be done strictly with the hardware and software only available through Apple’s iOS ecosystem and nothing else. That doesn’t mean only iOS in it’s entirety will be used in everything from point A to B since Tim will be doing most of the heavy lifting for getting content posted, but it does mean that all of the stuff I personally create will be within the confines of what I brought with me. I’m hoping that I won’t be necessarily restricted as far as apps go since I’m sure I’ll see some really great stuff while at the Macworld/iWorld Expo and will try to incorporate some of those solutions into my workflow. However as I write this, I believe I have all the tools I need to get everything done that I need to. 1. iPad generation 1, 64GB, 3G with ATT. Even for a first generation device, Apple got nearly everything right. Sure the iPad 2 is faster, has cameras, and so on but the iPad 1 is still a pretty amazing machine. 2. iPhone 4S, 64GB, 3G with ATT. So far I really love this phone. I waited out the iPhone 4 and kept my 3GS and the difference in performance is incredible. The camera is great for both still pictures and video. 4. 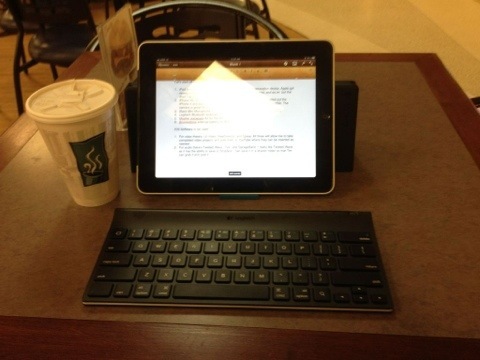 Logitech Bluetooth keyboard with built-in iPad stand. 5. Mophie Juicepack Air for the iPhone 4S. 1. For video there’s 1st Video, ReelDirector, and Splice. All three will allow me to take completed video projects and post them to YouTube where they can be inserted as needed. 2. For audio there’s Twisted Wave, iTalk, and GarageBand. I really like Twisted Wave as it has the ability to save to DropBox. I can save it in a shared folder so that Tim can grab it and post it. 3. For blogging I’ll be using Apple’s Pages program for iOS and then copying and pasting into WordPress. 4. Speaking of WordPress, I’ll be using the WordPress iOS app as well as the online version through Safari. It works well online but is slow to update as I type which is why I use Pages to write the article first and then copy it into WordPress to post. 5. Pictures are taken on my iPhone and then transferred between the phone and the iPad via DropBox. Using all these applications and online services should allow me to go completely iOS this year at the Macworld/iWorld Expo. If it all works like I think it will, I’ll have dropped about 30-400 pounds of stuff to drag along on the show floor. I’ll keep you posted on how well it works out but I’m looking forward to the trying (and hopefully succeeding). I really like Blogsy on the iPad for posting to Wordpreas (and other) blogs.